BOCA RATON, FL (January 21, 2012)— As the tournament roster continues to take shape for the 2013 Allianz Championship, two PGA Champions Tour rookies—Naples resident Rocco Mediate and Australian Steve Elkington—will take on the field as a celebrated roster of golf legends will descend onto The Old Course at Broken Sound Club from February 4th-10th for the seventh consecutive year in Boca Raton. Tournament week is jam-packed with interactive “events within the event” before and during championship play with opportunities for “up close and personal” interaction with pros for golf fans of all ages. In addition to three days of championship play, the Allianz Championship features a Women’s Power Breakfast, Clinic & Pro-Am with LGPA legend and eight-time “Player of the Year” Annika Sorenstam; two days of Executive Pro-Am play pairing participants with PGA pros; a “social, power & play” opportunity at the “Grapes On The Green” Golf & Wine Experience held overlooking the 18thgreen during second round play; and the popular Saturday Family Day presented by Tommy Bahama. Michelob Ultra Partners Club Day Pass-(Friday, Saturday, Sunday): $75 per day, includes access to air-conditioned tent with sports bar atmosphere located on the 18th fairway, food and beverage included with complimentary beer and wine; spirits on cash basis. · One Day Pass (Wed.-Sun. ): $175, includes unlimited food, wine, beer; VIP Parking Pass, access to private restrooms. · Weekend Pass (for all days Fri.-Sun. ): $450, includes weeklong Club 18 seating, unlimited food, wine, beer; VIP Parking Pass, access to private restrooms. Sponsorship packages include branded opportunities, premium seating, and a variety of invitation-only receptions, Pro-Am play, meet and greets with the legends of golf, etc. For more tournament information, tickets, premium ticket packages, skybox and VIP seating, Grapes On The Green event tickets, call 561-241-GOLF (4653); fax 561-241-4658, or visit www.allianzchampionship.com. For Pro-Am registration and sponsorship package opportunities, contact Anthony Greco at 561-241-GOLF (4653) or email agreco@allianzchampionship.com. 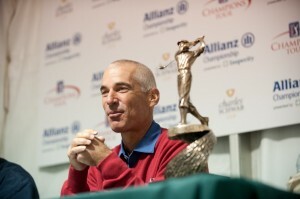 Follow us at Facebook.com/AllianzChampionshipand on Twitter @AllianzChamp. The 2013 Allianz Championship, in its seventh consecutive year at The Old Couse at Broken Sound, will bring the legends of golf to Boca Raton from February 4th to 10th for the first full-field PGA Champions Tour event of the season. Its 2012 champion Corey Pavin is set to defend his title as challengers Tom Lehman (2011 champion; 2011 and 2012 Schwab Cup winner); Bernhard Langer (2010 champion), Mark Calcavecchia, Fred Couples, Fuzzy Zoeller, vie for a $1.8 million purse with all three rounds televised live nationwide on The Golf Channel. The Boca Raton Champions Golf Charities (BRCGC) serves as the operational and financial oversight group for the event as well as for the distribution of all charitable funds, as all net tournament proceeds “chip-in” to benefit Boca Raton Regional Hospital. Managed by Pro Links Sports with title sponsor Allianz Life Insurance Company, the annual tournament has attracted 31 of the top 34 professionals on the money list. For skybox tickets and other hospitality, call: 561-241-GOLF (4653) or visit www.allianzchampionship.com. Follow us at Facebook.com/AllianzChampionshipand on Twitter @AllianzChamp. Minneapolis-based Allianz Life Insurance Company of North America (Allianz Life) provides annuities and life insurance products in the United States in all states except for New York. In New York, annuities and life insurance products are offered by Allianz Life Insurance Company of New York] (Allianz Life of NY). Allianz Life offers an extensive portfolio of products, including fixed and variable annuities and life insurance. These products are offered through a network of more than 100,000 financial professionals nationwide. The company is a principal subsidiary of Allianz SE, a global financial services group that is the 20th largest corporation in the world based on revenue (Fortune Global 500, August 2010). Allianz SE employs nearly 155,000 people worldwide.